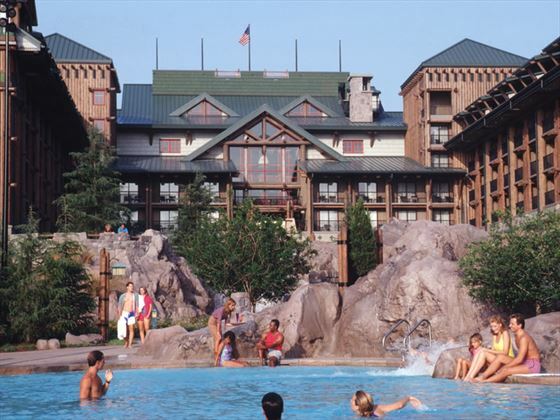 Boasting the grandeur of the great lodges of the American Northwest, Disney’s Wilderness Lodge offers a relaxed atmosphere and refined décor – perfect for unforgettable Disney holidays. Take in the luscious scenery, dine at one of the fantastic themed restaurants or splash around in the Silver Creek Springs Pool – and don’t forget the theme parks! We love the attention to detail that has gone into the creation of this hotel. The lobby is masterpiece with an impressive totem pole, carved with everyone’s favourite Disney characters. There’s also a towering fireplace to add to your sense of wonder. If you feel your appetite brewing, there are two fantastic full service restaurants on site, including the rustic elegance of Artist Point. Alternatively, if you’re just looking for a quick bite to eat, try one of the fast food joints. Top Tip: Got a Disney shopaholic somewhere in the family? One of the benefits of staying at a Disney hotel is that many of your shopping purchases (from the Disney parks) can be delivered straight to your Disney Resort hotel so that you don't miss a minute of fun! A Disney Deluxe Resort located in the Magic Kingdom resort area. 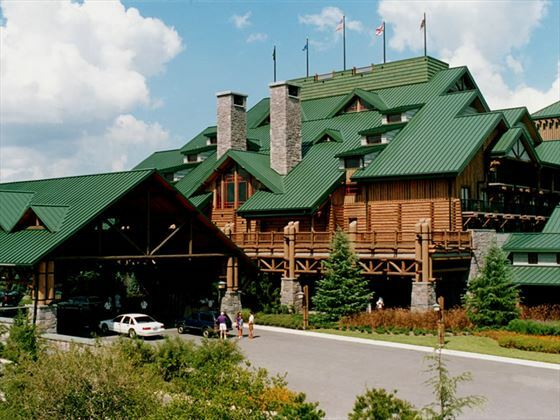 This wonderful hotel is located in the Magic Kingdom resort area, close by to Walt Disney World's epic theme parks. With complimentary transport to each park, it'll be easy for you to have a fun-filled day. 727 rooms on eight floors in one building. Standard rooms have either one king size or two double beds. Rooms with bunk beds or a sofa bed are also available. Rooms with a view of the lake or the surrounding forest are also available at a supplement. Bike Rentals: Rent a bike and enjoy the 1.2 kilometre path to Disney’s Fort Wilderness Resort & Campground. Horse-Drawn Excursions: Take a relaxing, old-fashioned wagon or carriage ride through Disney’s Fort Wilderness Resort & Campground. Cub’s Den: Enjoy a parents’ night out and treat children ages 4-12 to an evening of supervised activities, computer games, Disney movies, dinner and snacks in an environment created just for them. Chip’n Dale’s Campfire Sing-a-long: Gather around the campfire for songs and fun, then watch a classic Disney movie under the stars. In an effort to make your future visits even more magical, Disney’s Wilderness Lodge is currently undergoing extensive refurbishments. Please be aware that you will very likely see and hear construction work throughout your stay. To minimise disruptions, work will be carried out after 9am and before dusk. At this time, many areas remain closed, including the Boulder Ridge Cove Pool, beach, marina, playground and more—with a planned reopening scheduled for 2017. Pathways like our nature trail will be unavailable, and surrounding views may be altered. However, Copper Creek Springs Pool will remain open and boat transportation to Magic Kingdom park will still be offered. Between February & July 2017, Roaring Fork Snacks will close for refurbishment as well. In its absence, Geyser Point Bar & Grill will serve breakfast, lunch and dinner, and Territory Lounge will also offer a continental-style breakfast with gourmet coffees, pastries and more. Work is due to complete late July 2017. Prices correct as at 6pm on 18 Apr 2019. Please call for final price. Prices are per person based on 2 adults & 2 children sharing. Other durations available - call for quote. Prices include flight and accommodation as stated below and transfers on Disney's Magical Express, this is available from Orlando International Airport only. For more car hire and transfer options please ask your travel expert. For the purposes of the prices above, children are assumed aged 11 and under. Teen prices also available. 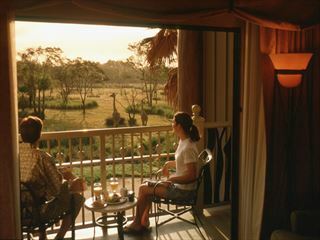 An African lodge style resort set in a 43-acre wildlife reserve, you will have an unforgettable experience at this Disney Deluxe Resort. This hotel is a destination in itself featuring over 30 species of wildlife that roam the savannas. Disney's Contemporary Resort is one of the most famous at WALT DISNEY WORLD Resort thanks to the monorail tracks running directly through it and the views onto Magic Kingdom. It makes for an amazing, luxurious family holiday. 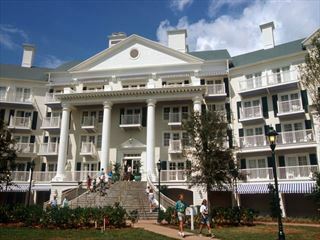 One of Disney's most stylish and charming hotels, this is a fantastic choice for a family holiday. You're within easy travelling distance of the amazing Disney theme parks, and set directly on the famous BoardWalk.